Today's post is pretty exciting for me since I was dying to get my hands on this polish after seeing swatches floating around on other blogs. Luckily, my friend Ashley had a few extra and was willing to give me one, thanks Ashley! 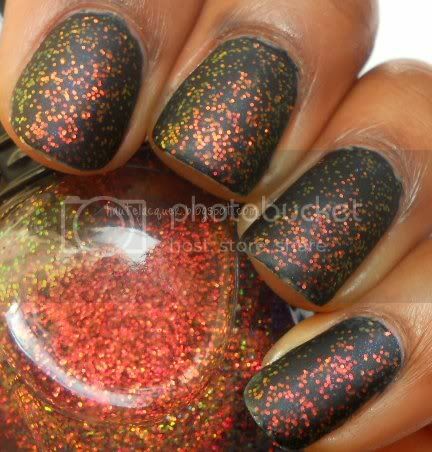 Sally Hansen Pumpkin Spice is an orange glitter suspended in a dark brown, jelly base. I have heard that this is sheer on it's own so I layered two coats over Savvy Chocolate just to be safe. The application with this was great. I love the brush on the Xtreme Wear line so I've come to expect flawless application. Pumpkin Spice is beyond gorgeous! Considering this is my first Halloween as a nail polish collector, I'm more more than happy to have this as my first Halloween nail polish. This is a manicure I did Saturday night. I always do the more time consuming and less simple designs on the weekends, that way I can leave the weekdays open for studying and I won't be distracted. Anyway, I saw this picture on tumblr about a month ago (I don't know who to properly credit since I saved it on my computer, sorry!) and I really wanted to try it. It was relatively easy to do but pulling off straight lines were difficult. I wish I had a white polish that I could have used for this, oh well. I love the end result though, LOVE! For this manicure I used OPI Skulls and Glossbones as the base. Then I created a thick gold stripe with Color Club Enchanted Holiday. Using my nail art brush and a black polish, I drew a horizontal line through the middle of my nails. 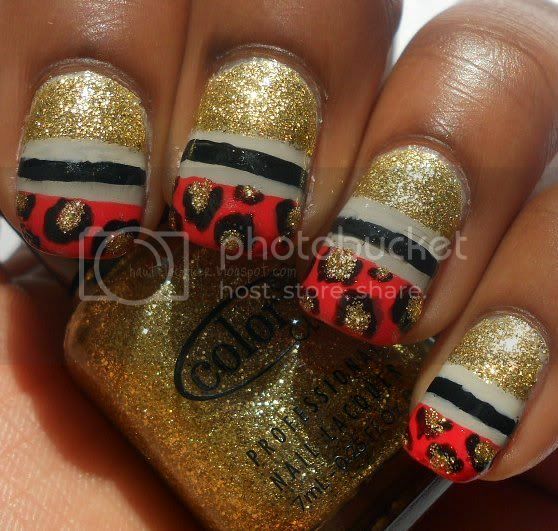 The leopard tips were made with a base of Wet N Wild Heatwave. For the spots I used the same Color Club Enchanted Holiday polish as the gold stripe and the leopard outlines are made with a black polish. These are so "in-your-face", I just love it. I'll admit that one of my favorite parts of creating posts is coming up with a title. I'm very happy about this one! I don't know why but I just think it's cute. Anyway, I'm excited to show you this design I created a few nights ago. I wore this throughout the beginning of this week and my sister also loved it so I recreated it for her. I remember being so clueless when I sat down to do something on my nails. I really had no idea what design I wanted to do and then I just settled for this. I didn't think I'd love it this much though! Also, I got this great idea from Rebecca Likes Nails who got it from Gettin' Girlie. Ignore my dry skin, my skin has been suffering ever since I switched back to nail polish remover with acetone in it. For this manicure I used Revlon Garden as the gorgeous, medium, muted grass green base. Then I used my dotting tool and created silver dots of Fingerpaints Easel Come, Easel Go!. I let it dry for a few minutes and went back over the silver dots with Revlon Garden, which is what creates the "O" dot effect. I really like this and I also love the base color! When I think feminine i think pink and girly but this is very feminine to me for some reason. It's so subtle and pretty in real life. My family doesn't have a nickname for me. Alright, I've mentioned this before but when I am going to bed I will check and double check that my bedroom door and all bedroom windows/blinds are closed and shut tight. I can't sleep any other way. Well, I have a fear of throwing up. Emetophobia. I have not vomited since I was a baby and even then I was too young to remember. I just assume that I threw up as a baby. The thought of food going up my throat and out of my mouth horrifies me! I'd rather ride a tortoise (I'm also scared of oversized animals) than throw up! I mean, does it hurt? Can you even breathe? It just seems really, really scary! Set Fire to the Rain by Adele, whenever I get home from school I go straight to this song! When people stare, I just want to go over there and punch their eyes out. It's insanely annoying. Over thinking. I really need to deal with it because when I get nervous and anxious I overreact, over think and I start to panic. And then I bottle up my feelings and it turns out to be a huge mess. On the very edge of the right side of the bed. As in, if you're looking from the foot of the bed. If I could remember, I would tell you. That was forever ago. I don't know, a Vanilla Frappuccino I guess. I like to keep it simple. Tugging at my eyes. I know I shouldn't but sometimes it's easier to apply eyeliner that way! Towards the shower head. It feels refreshing. At the top of my head I would say candy. It's weird...I don't have a sweet tooth for cakes, cupcakes and that sort of thing but candy I could eat for breakfast, lunch, and dinner! I'm so boring, I don't say anything worth telling. Silk pajama bottoms (they're so comfortable!) and a tee shirt. This is still Friday Poll so I'm tagging all of you! Feel free to copy and paste your answers in the comments. I really want to hear your answers on this one! Some of you were curious to know what my nails looked like on the first day of school (Monday the 15th) so here it is! A few nights before school started I saw this tutorial by Robin Moses and I knew that I had to try it! I'm always inspired by what she creates. Robin makes great videos that explains everything she is doing and why she is doing it. It really helps for when you want to try something out and don't know where to begin. Hers turned out a little more clean but...well, I'm just Shaina, she's Robin Moses. 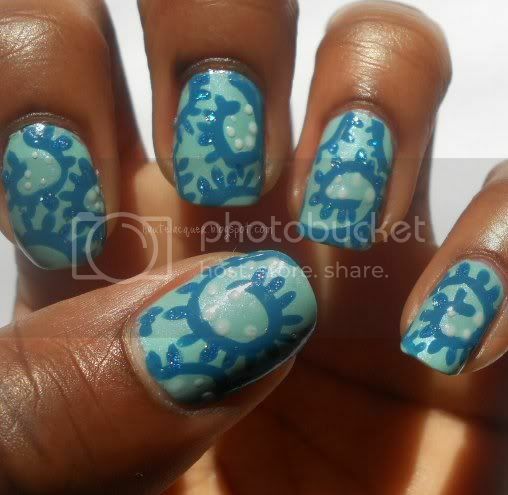 For this manicure I used Essence Forget Me Not as the base. 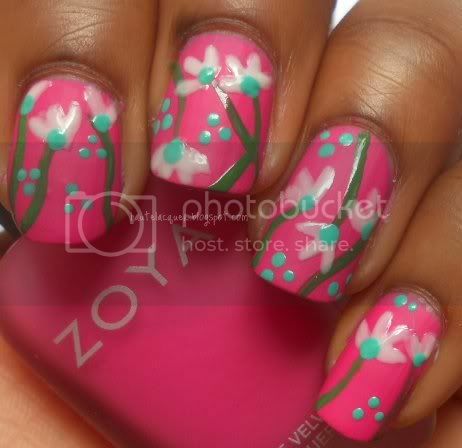 I began by drawing swirls and lines all over my nails with Zoya Breezi and a nail art brush. Then I drew small lines coming out of the swirls. Robin highlighted this design with glitter on the little lines, so I did too! The glitter I used is Sinful Colors Hottie. I still didn't fell like it was enough so I added white dots to random places on each nail. Topcoat was really beneficial to this design. I wasn't sure if I liked it on me and then I added topcoat and fell in love! Also, I discovered a new-to-me blog a couple days ago that I want to share with you. It's called Nail Nerd. 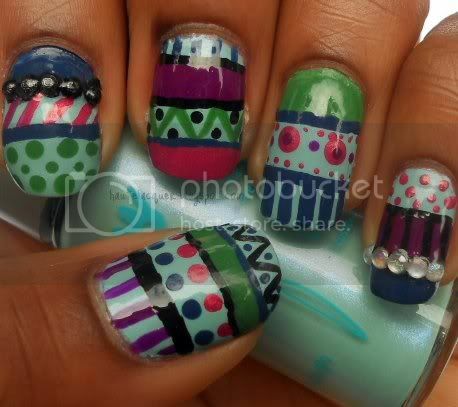 Her nail art really amazes me. Her creativity is insane and she is so original! That's all, I hope you all have a great day! Yesterday I showed you Kleancolor Chunky Holo Black mattified but today I have the equally stunning Bluebell to show you matte! After trying Chunky Holo Black with a matte topcoat, I knew I had to post Bluebell too. I think these were made to be worn with matte topcoats. For this manicure I started with two coats of CCUK Midnight Blue. I then layered two coats of Kleancolor Chunky Holo Bluebell on top of that. I finished it off with Essie Matte About You. I think the end result on this one is a lot more exciting. I just LOVE it matte! Today is another Monday, the weekend just flew by! I guess I should start getting used to it. So the theme this week in PAA was "Creative Layering". Which just means layering different nail polishes for a crazy and fun combination. I didn't go too crazy since I was dying to wear Kleancolor Chunky Holo Black and also to use my new matte topcoat that I got from my sweet friend Nicola! I got a ton of compliments at school too. Not so much "oh, that's pretty" but more like "wow, your nails look so cool" or "this is amazing, how does it do that?" Yeah, it was a good week. For this manicure I started off with one coat of Rimmel London Black Satin as the base. Then I layered on one coat of Kleancolor Chunky Holo Black. After letting it dry I added Essie Matte About You matte topcoat. Apparently it wasn't dry enough when I added the matte, as you can see by my horrendous index finger. I later re-did it and was still very happy. This is one of my favorite layering combinations! Again, nothing extravagant but I think it looks pretty amazing. This is a design I created about two weeks ago. It was pretty random, I wanted a design that I could do without having to be super specific or perfect. This worked great for that! I literally just started drawing random lines and dots and came up with this. For this manicure I used Essence Forget Me Not as the light blue, shimmery base. Then I started to create lines and dots using China Glaze First Mate, Catrice Big Spender Wanted, China Glaze Starboard, Rimmel London Black Satin and Claire's Vegas. The black and silver rhinestones are from Born Pretty. Okay, so it's not perfect, but it was a lot of fun creating this! It's like tribal print, but not really. When I created this, I wasn't going for anything specific. It took me a long though, probably a good two hours, so I ended up with just normal polish on the other hand. It's Friday again! Which means Dori of Kiss My Acetone has created another fun poll! 1. How has your week been so far? Long and tiring. I feel like I've been running around school everyday. It really is like exercise. Other than that, I've been having a pretty good week. It's been nice starting school. 2. What’s on yo nails? 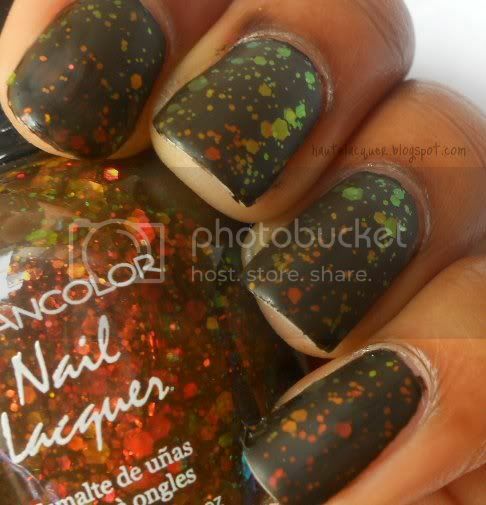 Kleancolor Chunky Holo Black layered over a black cream. I've gotten a lot of compliments on this polish and also a lot of people going "whoa, how does it change colors like that?!" Haha, it gets me every time. 3. What was your worst nail polish related accident (ie: spills, bottle breaks)? 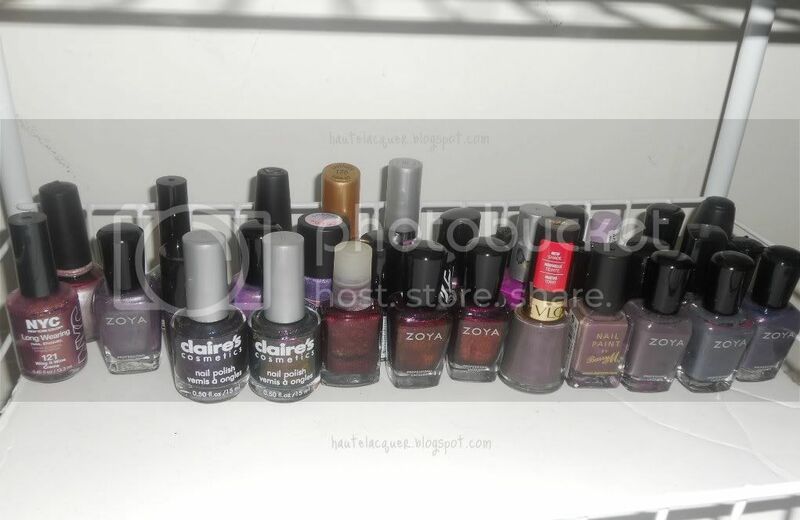 Years ago, when I wasn't really into polish yet, I kept all my nail polishes in a plastic container and one day three of them just broke, out of the blue. Nail polish was everywhere and that day three people lost their lives. A gorgeous military green, a perfectly opaque white and a really gorgeous blue polish. 4. Out of all the products you use in the summertime, which ones do you love the scent of the most? Hands down, my EOS Lip Balm in Summer Fruit. It smells and even tastes delicious. 5. 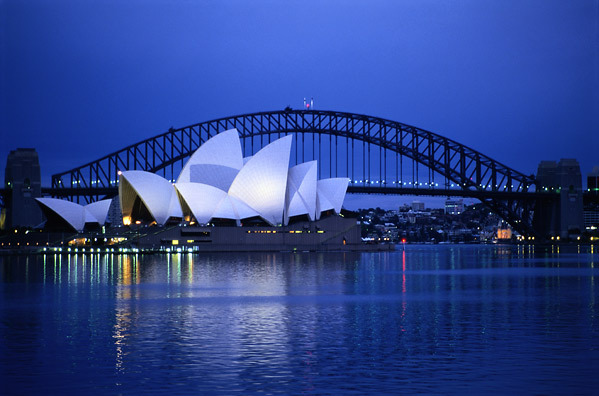 If you could move anywhere in the world, where would you move to? 6. What is your favorite part of painting your nails? A long time ago I'd say that I like getting compliments on my designs, but now, I'd say that I enjoy doing designs and nail art. I enjoy it and I find it relaxing. 7. What is your least favorite part of painting your nails? The smell, the smell, the smell! Some people think that because I do my nails so often, that maybe I no longer smell the horrible polish stench. I'm used to it, but I can definitely still smell it. 8. What type of mp3 player do you have? I don't own an mp3 player since I don't really listen to much music, unless it's Kate Voegele, Rihanna or Adele. 9. How often do you paint your toe nails? Every other week, for the most part. If I chip them I'll go ahead and change it. Once it starts to get cold though, I let them go naked and wear closed toe shoes. Don't be afraid to answer these in the comments below! Just copy, paste and answer. Today I'm showing you the last of my three Barielle Karma Kollection polishes. I had a lot of trouble getting good pictures of this color and manicure but the colors below are pretty close to accurate. I've been creating nail art for each shade and this one is probably my favorite design. You can still see just how pretty this color is but also the nail art is a nice touch. I call this, "The Leopard Moon"! I love half moon manicures and I love leopard print, so why not combine both? Here's Soul-er Powered on it's own! 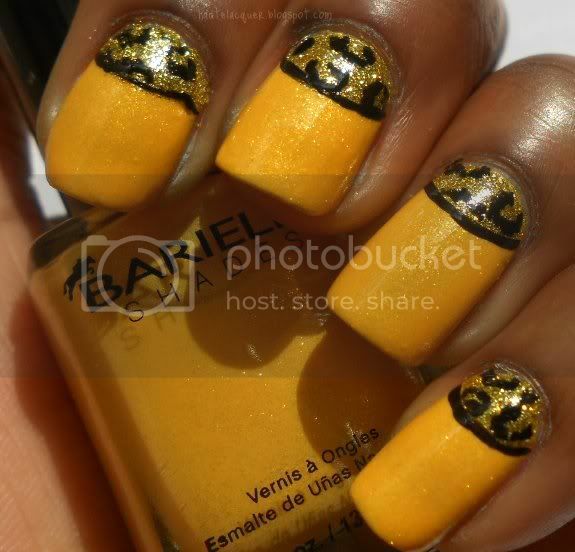 Barielle Soul-er Powered is a warm toned yellow with bright yellow and gold shimmer. The shimmer on this one never gets lost, it is packed with gorgeous shimmer. I used two coats for this. It was thick, but applied nicely. For this manicure I used Soul-er Powered as the base. I then created a half moon with Color Club Enchanted Holiday. I took my nail art brush and Rimmel London Black Satin and created black leopard spots on the half moon I previously made. To bring this design together I outlined the moon. What are your favorite yellows? I'm so excited to be showing you this polish today! I only have three nail polishes from the Barielle Karma Kollection but I will say that out of the three, this is my favorite. The finish on this one is so unique and beautiful. I also went back and created this random design. It kind of makes me think of a maze, or maybe those things that would hypnotize you? Of course I smudged my index as soon as I started taking pictures. There was no turning back, so I continued like it wasn't even there. 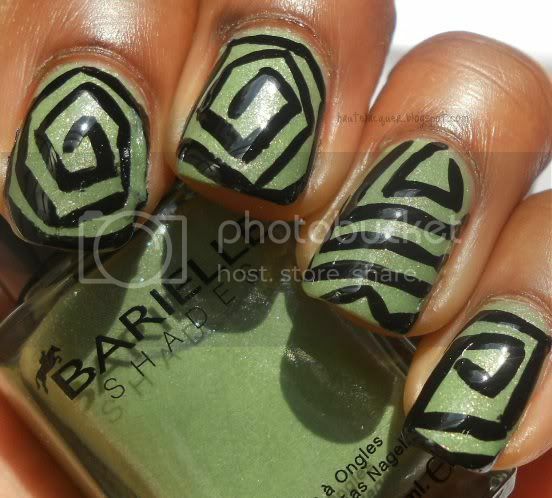 Barielle Positive ZEN-ergy is a medium mossy green packed with silver shimmer. At times, I even see gold shimmer, but maybe that's just what my skin is pulling out. The formula on this one was great! I used 2-3 coats and had no problems with thickness. This color is so stunning! Everyone must own it. For this manicure I used Positive ZEN-ergy as the base. Then, using my nail art brush, I started creating random lines with Rimmel London Black Satin. I tried to keep all the lines following one path but some of them don't. Lately I've been really into green polish, I'm sure some of you have noticed. You'll probably be seeing more green as the weeks go by! I'll be swatching my three Barielle Karma Kollection polishes this week and today we are starting with the gorgeous Do Unto Others! 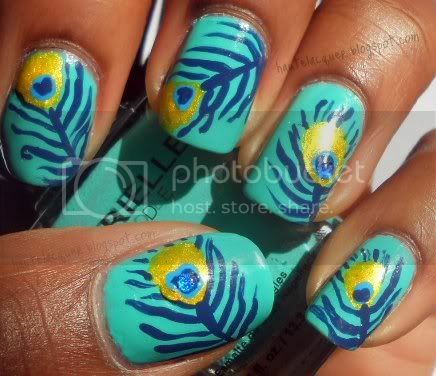 This is the second time that I have done peacocks on my nails. I first did them a couple months ago but looking back, I don't really like how they turned out. So of course, being me, I had to re-do them! I think they look better the second time around. And here's Barielle Do Unto Others on it's own. Barielle Do Unto Others is a bright turquoise cream with a bit of a minty tone to it. It applied perfectly in two coats. I probably could have done one though. This is only my second Barielle polish and I am more than impressed with the quality of their formula. The only complaint I have about this one is that it did stain my nails. For this manicure I used Do Unto Others as the base and I created the Peacock feathers using China Glaze First Mate for the root of the feathers and then Butterfly Jungle as the yellow center. Inside of the yellow center I put a dot of Zoya Robyn and then another of China Glaze First Mate. I added blue rhinestones for accents. I mentioned on Twitter that I would be going back to school today so I won't be able to post as I normally would. Today's post is a scheduled post. Most of the posts this week will be. But it's only until I find a posting, swatching and nail art routine that works for me. I was inspired to do this beautiful design after seeing JaeMarie2008's tutorial on "Simple Abstract Flowers." I fell in love with it as soon as I saw the video. It's so simple but I am obsessed with it! Here it is with a topcoat, I prefer it matte though. 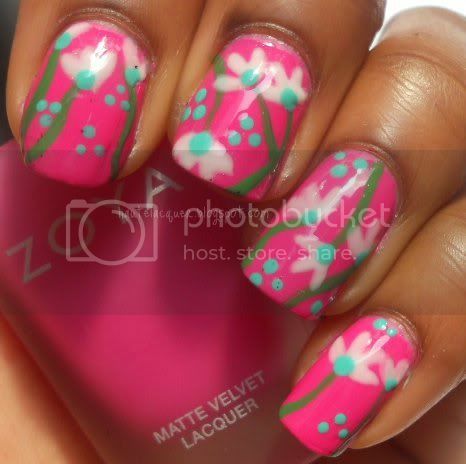 For this manicure I used Zoya Lolly--from the Mod Mattes Summer Collection--as the base. 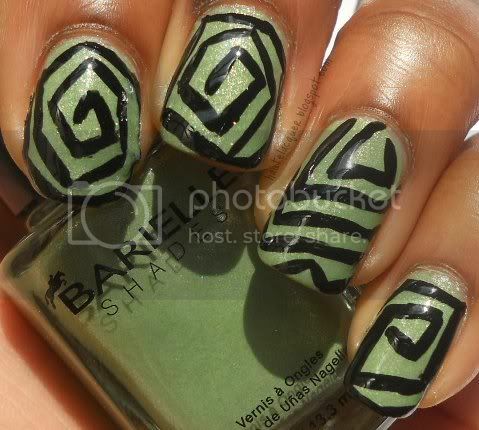 Then I started creating thin green lines all over the nails using China Glaze Starboard. Afterwards I took Wet N Wild French White Creme and I drew the flower petals. I went back in and drew the dots using Barielle Do Unto Others and a small dotting tool. 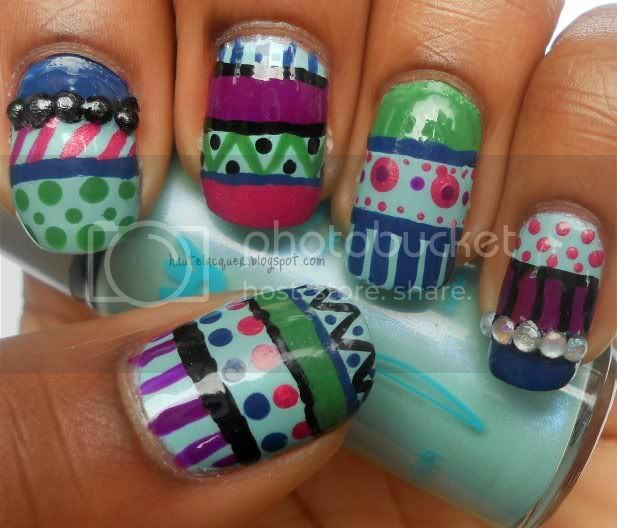 This could possibly be the most simple nail art I have ever done. It took me less than 30 minutes to create this. I only wore this for a day because I wanted something else for my first day of school mani. Beginner's Guide to Nail Art- Now LIVE! Just a quick post to show you what I've been working on for almost two weeks now. My beginner's nail art guide is now live! You can follow the link to get to it or find it under the "Check Out" section of my sidebar. I'm really excited that I got this up! I hope it helps someone out and that it was informative enough. I know it is long and very wordy but I felt like I had to mention everything for those who are fresh when it comes to nail art. Please feel free to leave your suggestions on what else I should discuss. But note that I don't do stamping or water marbling. I'll be back tomorrow with some nail art, I promise. Another Friday means another Friday Poll, brought to us by the lovely Dori over at Kiss My Acetone! Pretty good, blog wise and my personal life too. 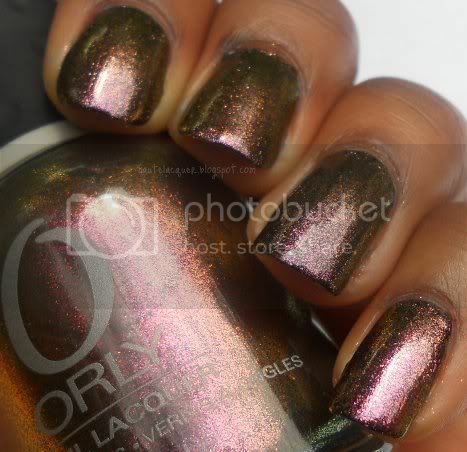 Finding Orly Space Cadet was a nice way to start the week! 2. Whatcha wearin on the nails? LOL, well, one hand is bare, naked, polish-less. 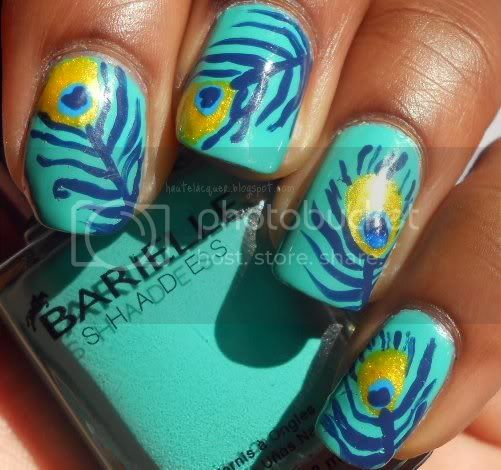 The other hand has Barielle Do Unto Others with peacock feather nail art (which you'll see soon!). I'll go back and do the other hand later. 3. What is your favorite store to shop for makeup at? Ulta, no doubt about it. I like that they have drugstore brands, higher end makeup and salon brands. I don't think it gets better than that. 4. What’s your favorite store or drugstore to shop for other non-makeup supplies at? Hm...maybe CVS Pharmacy or Wal-Mart. If I really had to choose between the two, it'd be Wal-Mart because they have more items and variety. 5. How has the weather been in your neck of the woods this week? 6. Have you had the chance to enjoy the pool/beach/river/lake yet this summer? Nope! And that's perfectly fine with me. I'm not looking to burn this chocolate out in the sun. 7. What are some of your favorite products to use in the summer time? Well I like Neutrogena's Pure & Free Sunblock, EOS Lip Balm, and Olay's Quench Body Lotion. I don't normally stick to one thing though, I like to try new products. 8. When do you usually transition from using summer products to fall products? Once October starts to roll around. The heat where I live lasts until September and it starts to cool down and get a little chilly towards October. 9. What is your favorite color to wear on your nails in the summer? Anything that is bright and/or shimmery! I especially love blue shimmers (like Orly Royal Navy). 10. What is your favorite color to wear on your toes in the summer? I like to wear purples and pinks on my toes. One color I will never stop loving for the toes is China Glaze Ahoy! Glass flecks look amazing on the toes. You can answer too! Copy and paste the questions and answer them in the comments. I posted my Zoya Smoke and Mirrors Review/Swatches a few weeks back and since then I've been noticing from my stats that a lot of you are looking for comparisons of Petra and especially Jem. I already did a comparison of Zoya Jem and Zoya Valerie in my original Smoke and Mirrors post, but I'm not entirely pleased with that comparison so I'm re-doing it. I promise I'll have some nail art soon, but for now, see for yourselves how these polishes compare. As you can see, there isn't really a difference between the two. I originally said that the only difference is that Jem has smaller (or finer) shimmer than Valerie, but I'm not too sure that's even true anymore. In my opinion, you really don't need both. They are practically the same polish, just with different names. I've also noticed people searching for Zoya Petra and Zoya Kelly comparisons. These two are not the same. They are both dusty grays and have purple tones but Kelly has more blue undertones than Petra and Petra is darker than Kelly. If you were thinking or buying one of the other I'd say get both! Both of these are must haves! Absolutely gorgeous. I'm pretty disappointed that Zoya would dupe their own nail polish. It frustrates me when companies do this. Jem and Valerie are identical twins. Luckily, this is the only one from the collection that they duped. 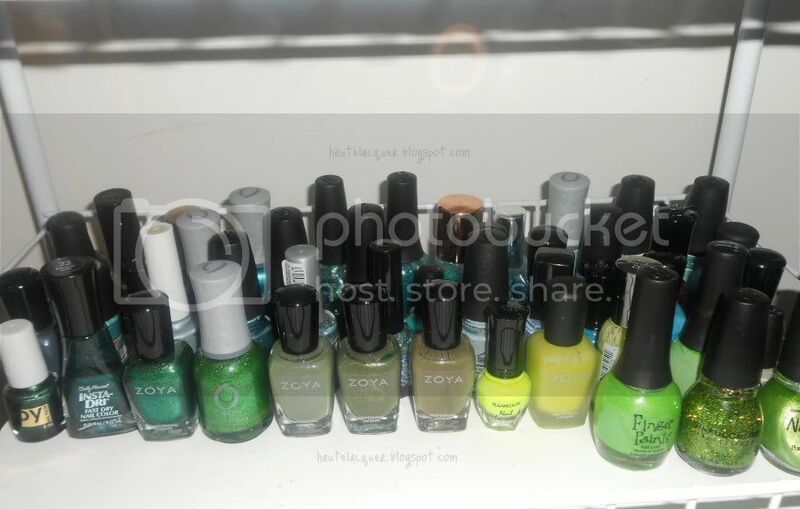 Zoya Kelly and Zoya Petra are two different polishes, they are half sisters at the most. Did any of you get Jem without knowing it was a dupe? Or did you buy Jem, even though you have Valerie, and you knew it was a dupe for it? 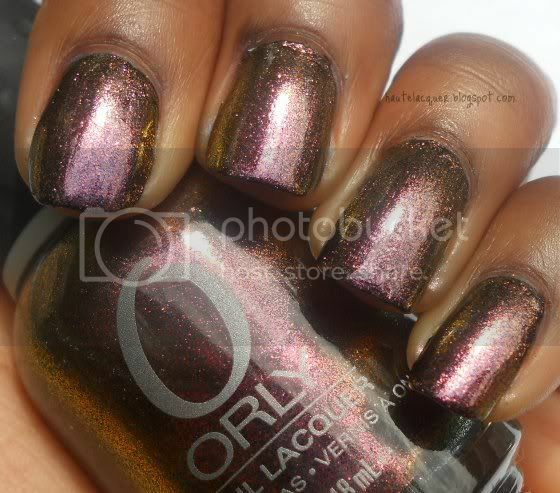 Today I'm showing you my favorite nail polish, Orly Space Cadet! I finally found it yesterday after searching for it for months. I know there are a million swatches of this already, but lucky for you, you get to see one more. I'll let the polish do all the talking. I'm sure your jaw has dropped to the keyboard by now. 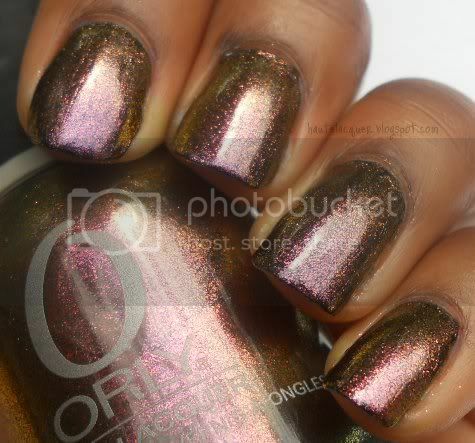 Orly Space Cadet is this amazing gold/orange/copper, green and purple multi-chrome foil metallic. I couldn't pick up much of the green, but believe me when I say it's there! Space Cadet is pretty sheer so I layered it over one coat of Rimmel London Black Satin. 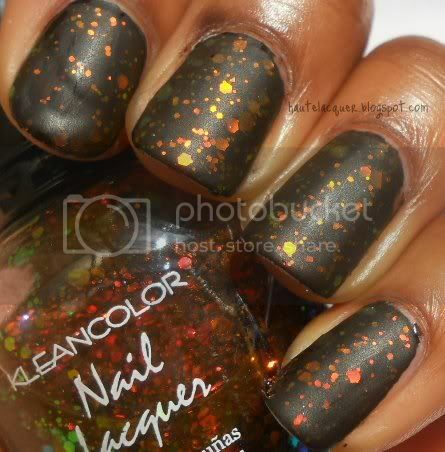 A close dupe for this is Claire's Venomous which I posted swatches of here. The finish of these two are a bit different though. I'm so happy I got this! It's now the best nail polish in my collection. P.S. I guess I should bring attention to that fact that I shortened my nails a few days ago. I'm getting tired of long nails for some reason. I just came back from Ulta where I found.....wait for it.......Orly Space Cadet! I couldn't even get my words out when I found it, I was like "Mom, I, I...look..I ..found...Mom....its...Space....Cadet! I have mentioned wanting this SO many times. Just search "Space Cadet" in the search box and you will see all the posts where I have mentioned this beauty and now I have it, sitting right next to me! It's weird, I've been stalking Ulta for close to 8 months hoping with some miracle I'd find it and today it was just randomly sitting out right in the front of all the other Orlys! 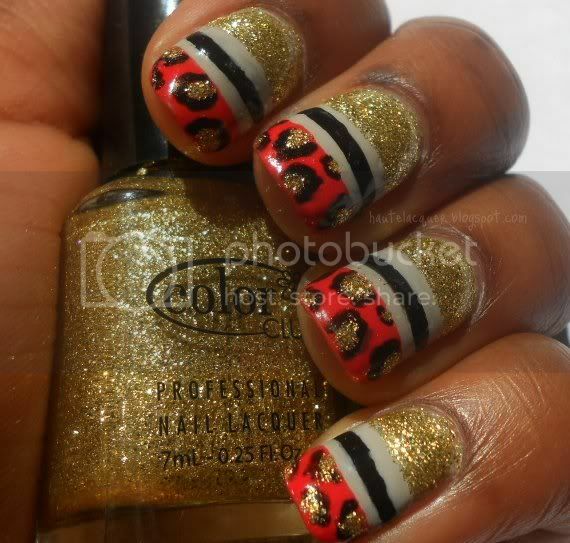 Anyway, this is the manicure I created for PAA, the theme this Monday is Animals/Animal Print. For this manicure I used two coats of Wet N Wild Bite The Bullet as the base. 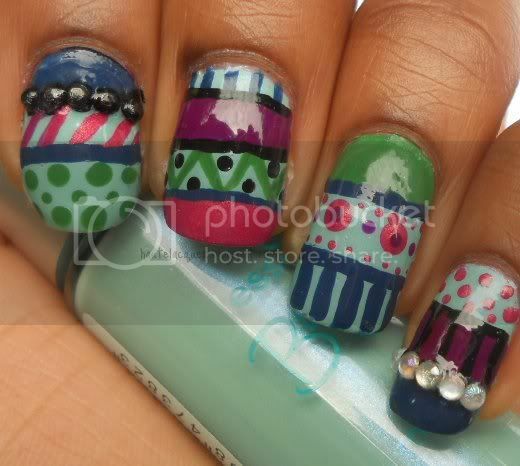 I used my nail art brush and created the spots using Zoya Petra from the new Smoke collection. I finished off with Seche Vite top coat. I called this The Mixed Giraffe because it was meant to be giraffe print, but it also ended up looking like cow print. But I still like it. Alright, that's it, I'm off to play with Space Cadet! 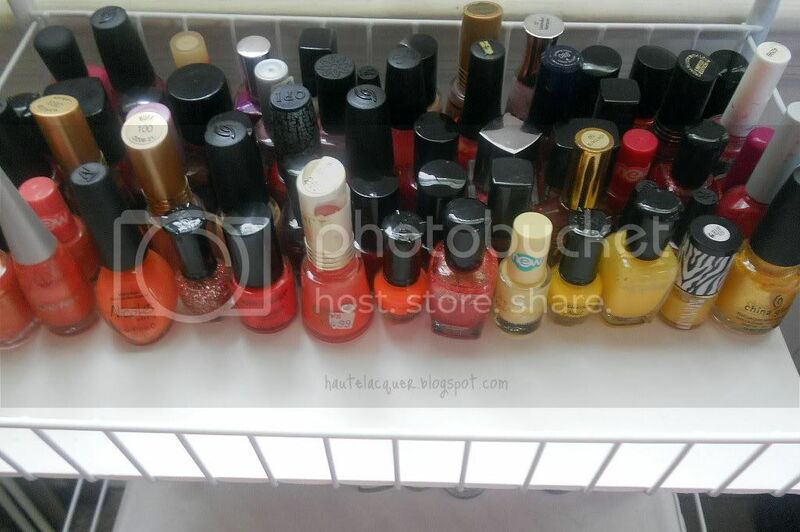 Today I'm showing you my nail polish collection and organization as well as my nail art collection. It's not fancy or anything but I enjoy taking pictures and showing my stash to you guys. This is my third collection post, my first one was here, and my second one was here. I asked on Twitter if you guys wanted to see pictures now that I'm over 200 bottles and I had a pretty good response so here it is! Remember, you can click any picture in this post to enlarge it. This is the same storage that I used the last time I posted my collection, now it's more full and I moved the purples down to that last bottom row--which was empty to begin with. I got this at Walmart by the way. 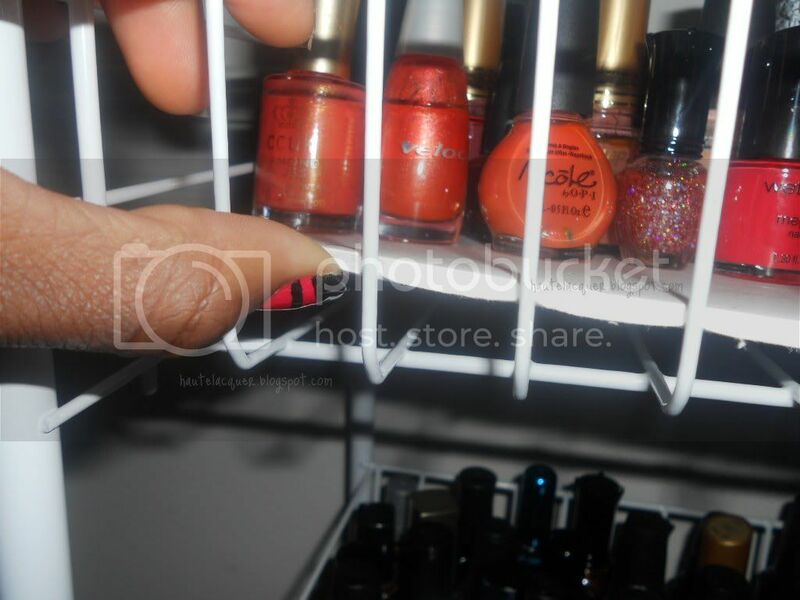 Top shelf: Pinks, reds, oranges, and yellows. This shelf has more than any other, I'm almost running out of space. Second Shelf: Blacks in the back, then there's silvers, whites, nudes and browns. That Wet N Wild white you see in the front has tooth marks because the cap was super tight and I tried to unscrew it with my teeth! Bad idea. Third Shelf: Greens and blues. All four of the Orlys that I own are on this shelf. Also, a lot of my Zoyas are here too. I have 28 Zoyas and 11 of them are green/blue. Zoya makes some of my favorite blues and greens. Purple had to have it's own shelf. It was taking up too much space in the first shelf so I moved it down here. The two Zoyas that look identical are Zoya Jem and Valerie. I'm telling you, they are exactly the same! Under each shelf I have a piece of cardboard, they would all fall through if I didn't. 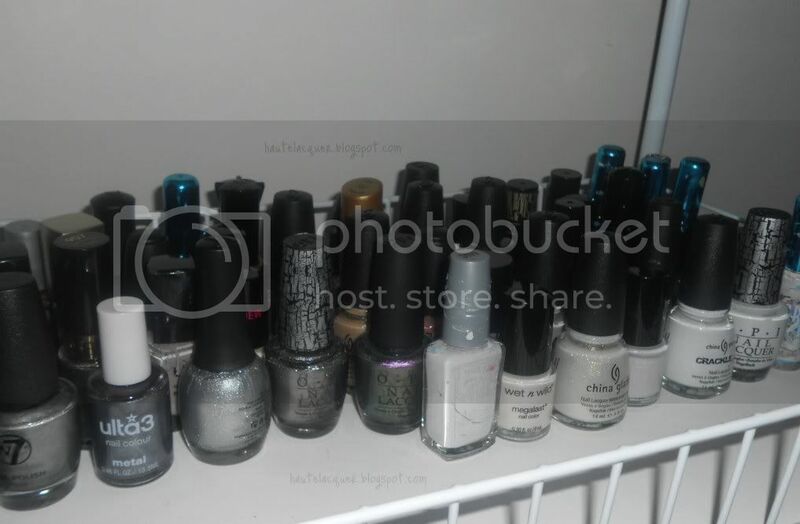 As of today I have exactly 205 bottles of nail polish. Zoya's taking the lead with 28, Wet N Wild is close with 21, and then I have 17 China Glaze polishes. 14 Kleancolors, 13 OPI and 10 Revlons. Check out my spreadsheet for specific polishes. My goal is to have 369 total polishes by next summer. 369 is my favorite number. I also have a "nail art collection". I try to keep it organized since I like to see everything, but it gets out of hand sometimes. Wet N Wild Mega Last Swatch Spam! Follower Appreciation Grand Prize WINNER!